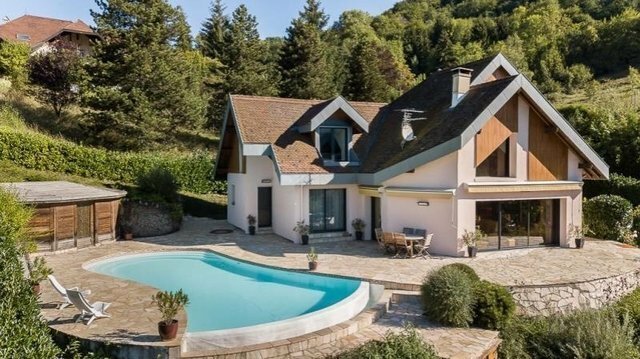 Superb property for sale with swimming pool and views over the bay of Talloires. Built on 2 000 sqm of land this large house of 170 sqm offers beautiful and bright volumes consisting of a double living room, a large fully equipped kitchen, a nice master suite and an office for the ground floor; the mezzanine upstairs, open to the living room, serves two beautiful bedrooms, a bathroom and a toilet. A basement with garage and exceptional wine cellar completes the ensemble.